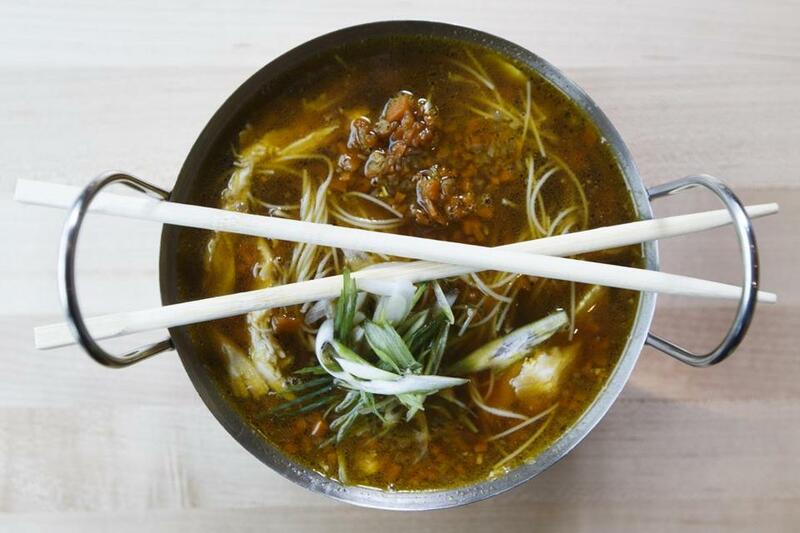 A noodle soup with bone broth, toasted rye noodles, chicken and vegetables at Area Four. The Boston Marathon takes place April 17, and runners looking to load up on carbs face an embarrassment of riches. Old-school meatballs? Sea urchin or Jonah crab? A pasta-style take on a Reuben sandwich? 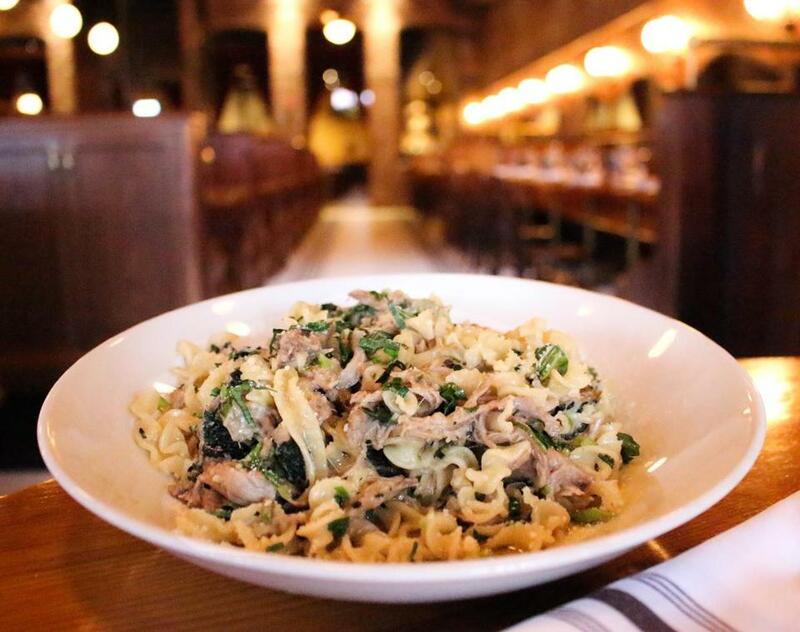 Read on for a selection of standout noodle dishes around town — to enjoy whether you’re running or just eating for support. At this family-run North End stalwart, pasta is made in-house, and gnocchi is a favorite. “I’ve loved gnocchi dishes since I was a little boy at the restaurant,” says restaurateur Philip Frattaroli. He put this version on the menu four years ago in April to satiate marathoners craving carbs with a pop of caper-driven salt. Now it appears on his menu every spring, splashed with a tomato sauce. “I just think the main ingredient, the cracklings, is so unusual,” says Scampo’s Lydia Shire. “We cut a slab of pork belly into big cubes, salt it overnight, and render it slowly in its own fat until it’s super-light, with just the right amount of salt. They’re so delicious, and they’re warm when they go on the spaghetti.” In fact, it’s the restaurant’s biggest seller. “We just can’t take it off! 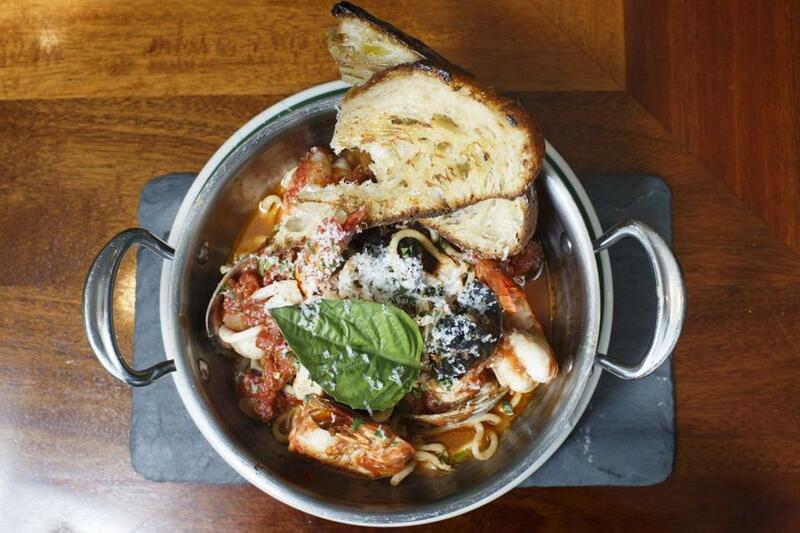 Anyone who eats at Scampo has it,” she says. Area Four co-owner Jeff Pond created this dish when his kids had strep throat. “My wife was making matzo ball soup, it was rainy and snowy, and I was playing around with noodles — but I didn’t want to do ramen,” he says. Instead, he concocted thin, spaghetti-like rye noodles that sop up his “intense” double or triple broth, made with veal and chicken bones, carrots, onion, and ginger. Mafalde with braised pig, green garlic, and nettles at Capo. At this cozy Southie joint, executive chef Tony Susi braises pig shoulders overnight in a buttery roasted chicken stock with onions and bay leaves. Then he tosses them with mafalde — a short, wavy pasta — and adds green garlic and nettles. “Green garlic looks more like a scallion, with a mild garlic flavor. It doesn’t have that strong, astringent bite,” Susi says. Nettles have a little sweetness, especially when sautéed with olive oil. “They’re kind of like baby kale,” he says. Healthy, maybe? 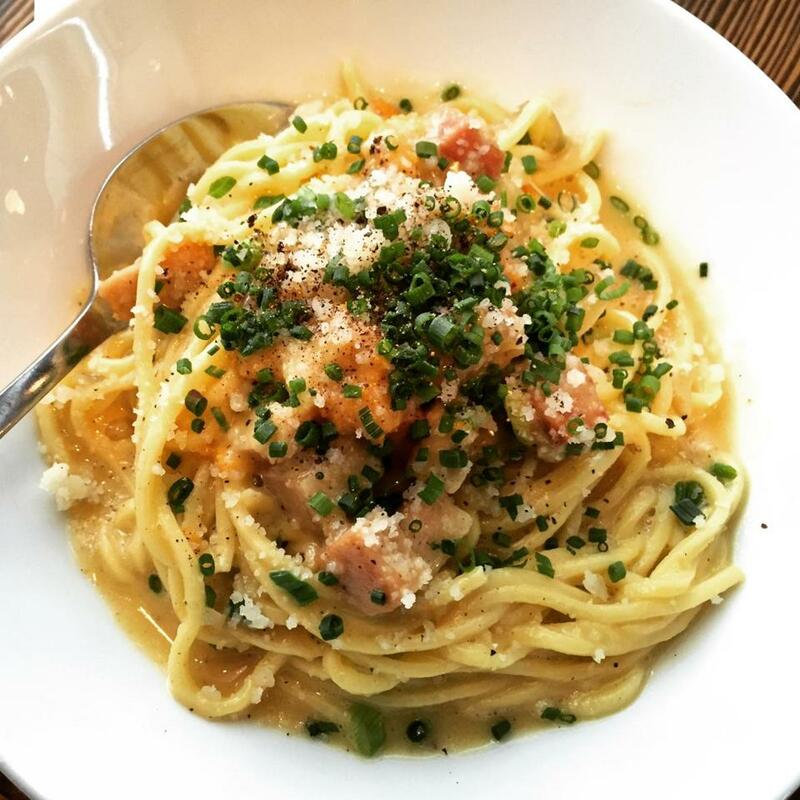 This romantic Somerville nook serves house-made whole-wheat spaghetti in sugo di mare, or seafood sauce, with a few surprises. The sauce has garlic, caramelized shrimp, lobster stock, Jonah crabmeat — and a splash of anchovy sauce called colatura, plus a kick of jalapenos. “We go a step above with the colatura and jalapeno for some more heat,” says chef Mike Bergin. A spicy seafood bucatini with mussels, clams, prawns, and the house diablo sauce at Saltie Girl. For a frills-free red-sauce feast, nothing beats this East Somerville hole in the wall. Step through the deli area and enter a garlic-scented, rollicking dining room filled with locals slurping wine like the world’s on fire. The heaping portion of linguine with homemade meatballs is a deal. Can you detect the secret ingredient? The ground beef is rolled with eggs, salt, pepper, grated Parmesan — and fresh mint, reveals manager Carmen Aniello. Uni carbonara (spaghetti, onions, black pepper, scallions, bacon, egg yolks, Parmesan) at Coppa. “One of my grandfather’s favorite Sunday meals was a Reuben with a martini,” says Townsman owner Matt Jennings, who created the rye-inspired dough as an homage to the classic sandwich. It’s served at the Chinatown restaurant with house-made pork sausage; instead of grandpa’s martini, there’s a vermouth glaze. Kara Baskin can be reached at kcbaskin@gmail.com. Follow her on Twitter @kcbaskin.